Tinder for cuddles. 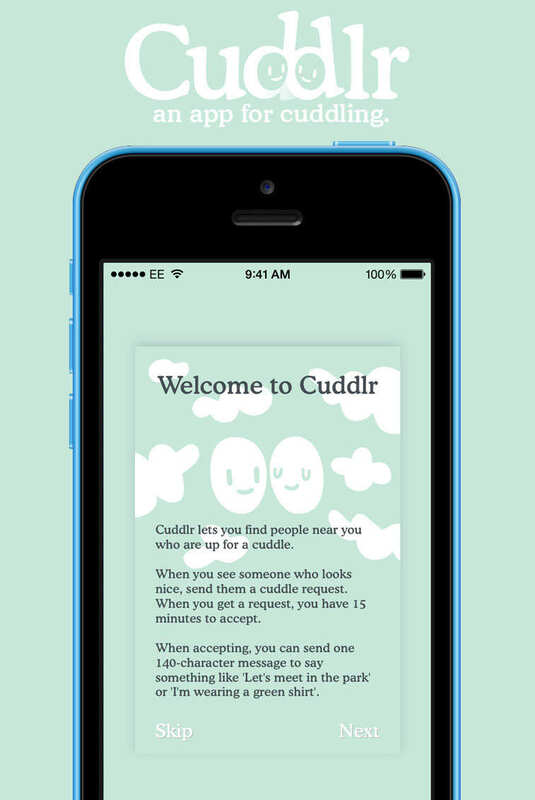 That’s what Cuddlr, a new app intended to connect people looking for a platonic cuddle, has come to be known as. It sounds like a joke; a fake app created, perhaps, to mock sentimental hippies who believe they can save the world, one hug at a time. But Cuddlr’s founder Charlie Williams is serious about creating a platform on which people can meet to cuddle, without any sexual or romantic complications. Cuddlr works similarly to the way Tinder and Grindr do: you log in using Facebook, look at people’s pictures and profiles, and tap on whoever you think looks cosy. When two people tap on each other’s profiles, they can send each other messages and agree on a place to meet for a hug. The inspiration for the app is Williams’ concern that people do not experience enough physical touch in the modern world. Touch is a pretty important human need. In the 1950s, American psychologist Harry F. Harlow did an experiment with a group of monkeys to test the importance of it. He created two ‘monkey mothers’, one out of wire near whom food was placed, and one out of a soft, comforting material. The baby monkeys spent more time with the huggable mother than the provider. Several experiments since have proved that hugging and cuddling release a hormone called oxytocin, which makes us happier. It may seem, then, that Cuddlr is providing a much-needed service, but you would have to be exceptionally naive to think everyone downloading the app is simply looking for a quick dose of warmth and happiness. Cuddlr has no security features to keep out those looking to prey on innocent young minds. You can report someone who has misbehaved with you, but all the app then does is let other people know that he is a ‘problematic cuddler’. Most journalists who have reviewed the app come back with stories of men who were simply looking for a hook-up. Cuddlr is potentially more dangerous than a dating app, as it will probably attract two extreme kinds of people: the dewy-eyed and the depraved. It can also be viewed as essentially providing criminals with a list of society’s most gullible, optimistic and vulnerable members.